Soundcraft Magnetics was founded in 1977 by Alex Nicholas of Brenell and John Eustace of Richardson Electronics, with the aim of developing from a clean sheet, truly professional multi-track studio tape-recorders. Alex's expertise lay in the transport deck while John's was in the advanced electronics - after all he had developed for Brenell the Mini-8 channel pre-amps. The new business was formed as a subsidiary of Soundcraft Electronics, a major competitor to Allen & Heath's mixers, for they too saw the potential in a mixer and tape-deck package portfolio. 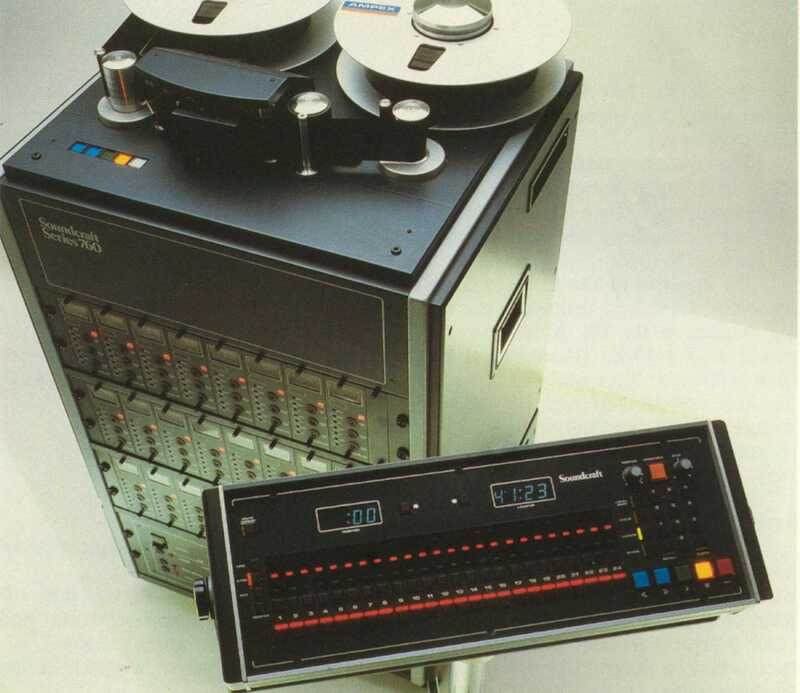 Their first deck was a 'portable' 3-motor, suspended 3-head, 1" 8-track: the SCM '381', launched in late 1979. This spawned a series of 1" and 2" versions in 8-, 16- and 24-track formats each comprising a deck, control unit, 8-channel amplifier unit and optional power unit within a simple, modular space frame block, allowing an easy upgrade to 16- or 24-track formats at a later date. The new deck proved an instant success and helped bring about the demise of the now out-classed A&H-B Mini-8. 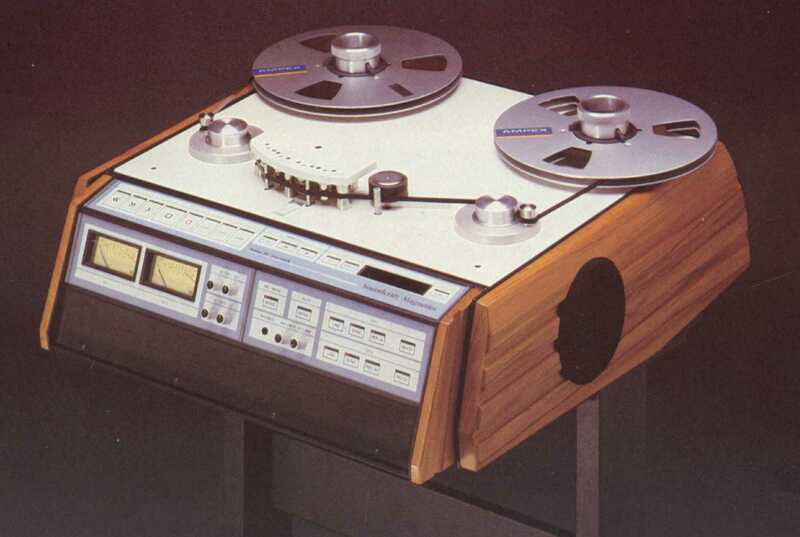 However the 380 series was at its limit on 2" tape, so an improved model was called for. Never-the-less, the reliable SCM 380 series remained in production until 1987. 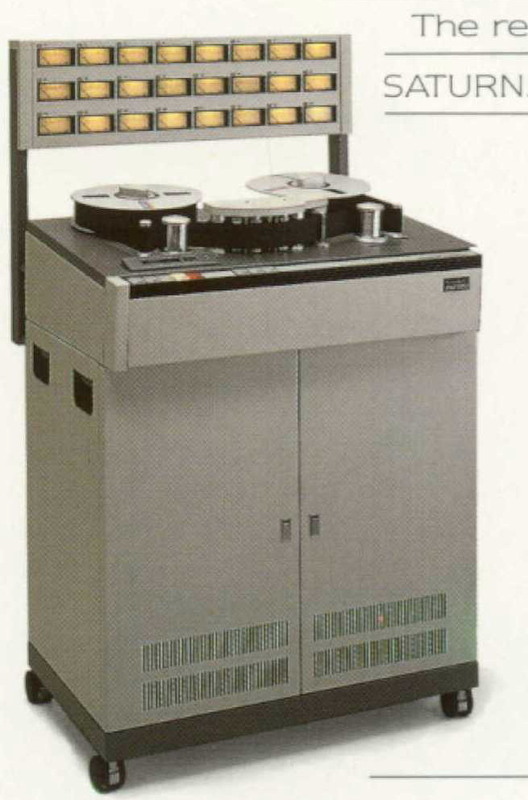 Developed from the 380 series specially for the more demanding 2" tapes, the 760 series arrived in 1980. It retained the modular construction and was offered primarily for 16- or 24-track operation. There was even a short lived 32-track version in 1987. 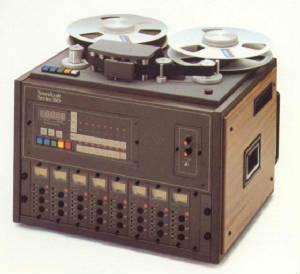 Seen here in its final form as the 24-track Mk.III, with its advanced remote control unit, the 760 series proved a serious competitor to the market leaders, Otari, Ampex, Sony-MCI and Studer, and proved to be a best seller for Soundcraft Magnetics, selling in its hundreds to singer song-writers, producers and studios, world wide. Of greatest interest was the development of a new NMT (New Multi-track) full synch deck of highly advanced, world beating design (it was eventually launched as the 'Saturn'). The NMT encompassed, and honed, cutting-edge computer controlled transport and analogue audio recording technologies but, in their wisdom, their parent Soundcraft Electronics wanted to add a 1/4" Stereo mastering deck to their portfolio which was not in keeping with Magnetic's philosophy! Overruled, the Stereo deck (later known as the S20), went ahead and usefully served as the working prototype for their truly advanced NMT. The S20 was designed for 1/4" or 1/2" tapes and up to 14" spools. The track format was easily changed by simply swapping head blocks: the computer software automatically sensing the format, and selecting the pre-set criteria. It was a stunning machine, and received rave reviews at its announcement in 1985, but it was riddled with technical glitches. A small batch was produced in 1985, followed by a much improved Mk.II scheduled for production in 1987 but in the end, it was considered too expensive for its intended market and the project was unceremoniously ended in spring 1987 just as it was about to enter production. Apart from a handful of decks under review with favoured studio-customers, the production decks, WIP and components were scrapped! The NMT was an astonishingly advanced design and was finally launched as the 'Saturn' in 1986 with great praise and high hopes, just ahead of the new Studer A820. 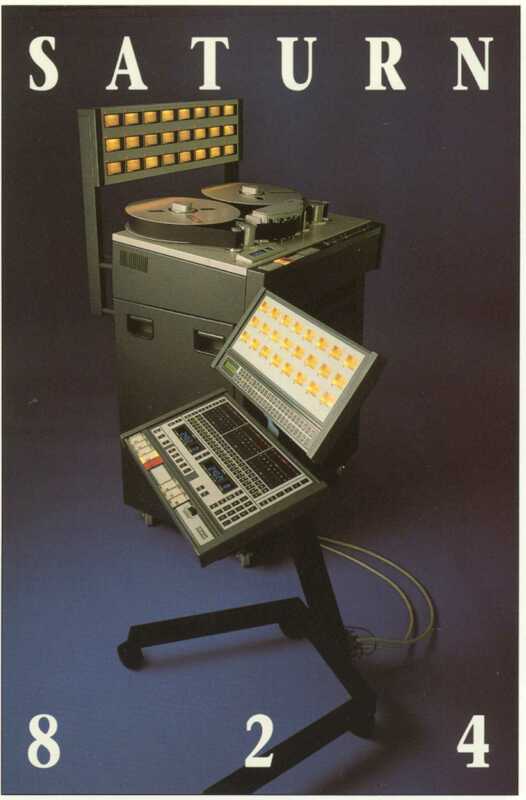 It caught their competitors on the hop being the first British deck to challenge Otari's dominance of the studio market. Unfortunately, the Saturn's (and S20's) development coincided with a serious financial crisis at their parent company, Soundcraft Electronics. It was also launched at a time when analogue tape was being gradually ousted by digital recording - and Soundcraft could neither afford to develop nor license the, then quite inferior, digital technology. Consequently the Saturn failed to achieve its true potential and then in March 1988, Soundcraft Magnetics was declared 'technically insolvent', and promptly closed. The parent Soundcraft Electronics, was duly sold to the Harman International group. As Soundcraft Magnetics was being wound down, certain assets and rights to the 'Saturn' were bought by a management team who formed Saturn Research. The surviving work-in-progress SCM 760s and Saturns were assembled by the new company as they concentrated on the 'Saturn 824' (24 track) and a budget '624'. While the company now lacked much of the extensive technical knowledge and R&D facilities of Soundcraft Magnetics engineers, with much of their precision engineering work now being out-sourced, they survived in the face of digital technology until 1992. Their decks were used at the 1992 Barcelona Olympics. The 'Saturn' would be the last British studio tape deck, bringing to a sad end 50 years of Brenell heritage. The full story is told in "Brenell - True to life performance".